Jennifer Kean and Mike Cross are bicycle riders training for a 4300 km ride from Vancouver, British Columbia to Austin, Texas, to raise money/awareness for cancer. 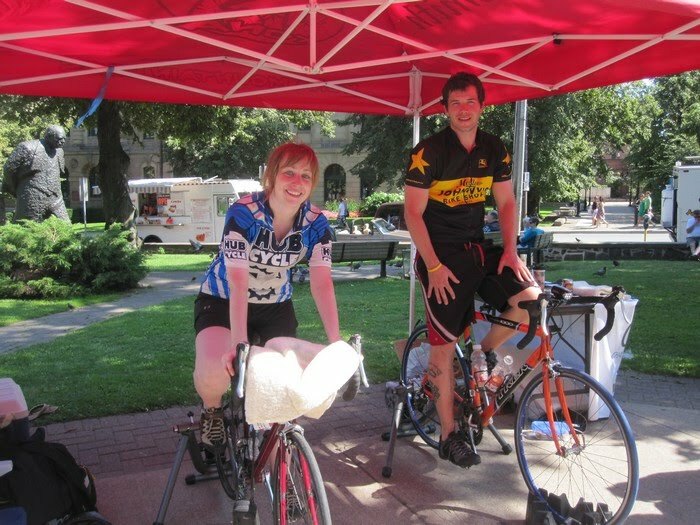 This year's ride will be the fourth year in a row a team has been organized by the Halifax charity/volunteer organization, GiveToLive, and both Jennifer and Mike have been personally affected in one way or another by cancer. 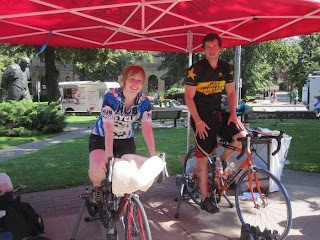 To help raise the $5000 each needed to take part in the ride, Jennifer and Mike took part in a gruelling 24 hour training session at the Spring Garden Road Library. This picture was taken in the 22nd hour, and poor Mike could barely move his legs. Please take a few moments and explore the interesting GiveToLive website to learn more about this great ride/cause. Additionally, please consider donating even a small amount to help support either Jennifer or Mike (or both).